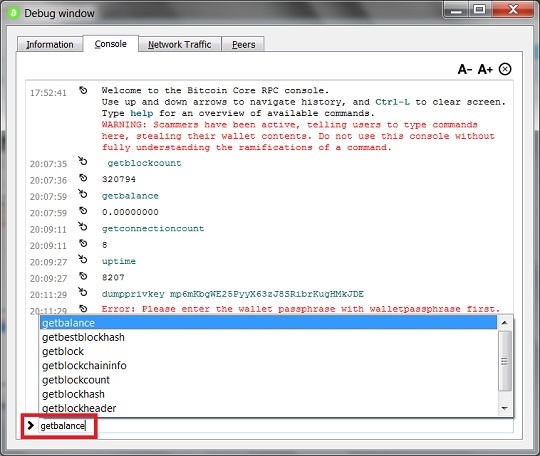 BitcoinQt, Bitcoin Core GUI, also provides us a debug console window to run bitcoin-cli commands. Click "Help > Debug window". You should see the "Debug window". Click "Console" tab. You should see the console screen where you can enter bitcoin-cli commands. Welcome to the Bitcoin Core RPC console. understanding the ramifications of a command. Good protection here. Private keys should not displayed easily on the screen. You should dump the private key for each your address that has a unspent fund with the bitcoin-cli command and keep it in another password protected file.